The following organisations offer training, networking events and volunteering experiences that may be of relevance to an existing or aspiring Trustee (charity or social enterprise) or public appointee. 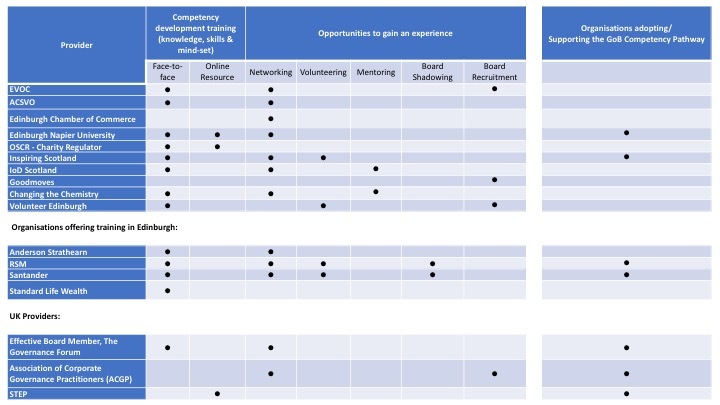 The following list identifies providers who offer training to develop board-level competencies (knowledge, skills & mind-set) and opportunities to gain an experience in the relevant sector to help students to demonstrate the learning outcomes in the GoB competency pathway. Organisations that wish to be considered as a provider should contact getonboard@napier.ac.uk for further information. The list of professional development opportunities has been gathered to include free and openly accessibly training and networking events. However, there are many organisations that offer relevant training at a cost and some requesting (or offering discount) for members. ACSVO – a membership organisation for third sector leaders and senior staff in Scotland. Edinburgh Voluntary Organisations’ Council (EVOC) – helps to support, develop and promote the interests and work of voluntary and community organisations in Edinburgh.